We all know how important proper eyewear is. The fact of the matter is that proper eyewear and quality eye care are essential to making your way through the world. So when it’s time for your regular eye exam, come to Cherry Vision Center. 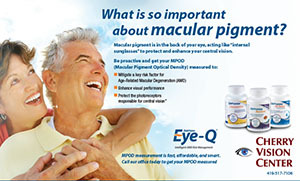 We can often save you more than many so-called discount eye chains. Please let our opticians show you how you can save and get the best in eye care. At Cherry Vision Center, we personally guarantee your complete and total satisfaction. We offer a full range of optometric services at fees you can afford, and we have been in business since 1987! Plus, we offer free consultation services, so you can get an idea of the costs up front!